The GameBoy Advance port of the SNES RPG suffered a lot. First off, the GBA lacked the superior soundchip that the SNES was so proud of. Secondly, the GBA didn’t have a backlit screen, so the graphics were compromised to make it look brighter. 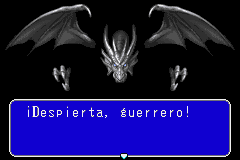 Thirdly, and most importantly, is that it still retains the same infamously bad translation as the SNES version. All these together state that the GBA port is inferior, right? Well, it’s a matter of opinion really. The character face sprites got an uplift and look more anime-ish. This works really well with the brighter palette and some may say it looks better than the SNES one. The titlescreen was overhauled to have a arguably titular look with the candle and all that. The GBA version also has portability as its non opinionated upside to the SNES version. Other cosmetic changes included the menus looking more like Breath of Fire II (which is better) and that a secret ending can be accessed. This secret ending is honestly nothing, and only serves as a preview of the sequel (which was absent in the SNES version for obvious reasons). Now lets go to the game itself. The game is tedious and also hard. Sometimes, you’ll need to grind. But once you get the hang of the game, it becomes fairly easy. While this varies from player to player, the difficulty curve smooths down later in the game. One thing that bugs me about the game is its vagueness. This might be because of the god awful translation or just faulty clues, but you’ll usually need to use a walkthrough since you’ll have no idea what you’re doing. The dungeons are repetitive and often really annoying. The places look the same and you’ll either get lost or in a dead end. Adding in to the repetitiveness is the soundtrack. While the soundtrack is greatly composed, they use the same song for all dungeons and the same song for all towns. There’s seldom any change in this. 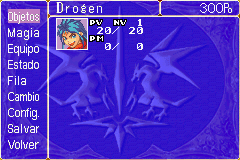 On the GBA, there’s games with graphics like Golden Sun. While its near impossible to replicate Golden Sun’s graphics, they could’ve at least upgraded the graphics. While they did do a lot of changes on the face sprites, title screen and overall brightness, there’s really no change on te normal sprites and overworld graphics. All that being said… The game is a classic. It’s not unforgiving or that tedious if thought on a grand scale (better than Lufia in that way). The characters are memorable and they all have their own developments. This game itself forms a staple for one of the best old RPG series. While it doesn’t deviate much from the RPG formula and battle system, you can see that this isn’t just some sloppy thing thrown together to form a game. A lot of dedication and thought was put into this game as shown by the extensive maps and scripting. All the characters are memorable. The story, while its not great, is also a true battle with good and evil. It also feels absolutely awesome when you get the dragon summons and become all powerful. The feel of progress really hits you as you start to traverse through seas and fly through the map. It really feels like a fully fleshed out RPG that delivers one whole epic adventure. 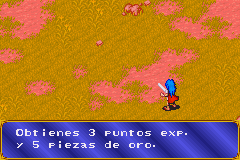 As a game, Breath of Fire is a great RPG for any die hard fan. But as a port on the GBA, it really needs a retranslation and a better facelift. Worth a playthrough. 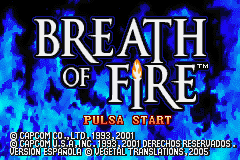 Of course, you could play Breath of Fire II, which was far better and fixed up a lot of this ones flaws. 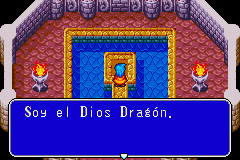 This is a Spanish translation of Breath of Fire for the Game Boy Advance.